When you think of the word "tall" amongst human beings, professional basketball players may come to mind. Within the animal kingdom and specifically among mammals, you may think of giraffes. The towering herbivores, simply put, have a serious height advantage over all the planet's other land animals, period. The basic height range for a fully grown adult giraffe is anywhere between 15 and 19 feet. In general, male giraffes are slightly taller than their female counterparts. 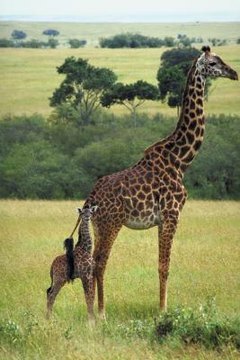 Kids' Planet notes that male giraffes attain heights of 19 feet while female giraffes often reach 16 feet. Giraffes are just long creatures in general, from their necks to their overall physiques even down to their tongues: Giraffe tongues are usually around 21 inches long. Giraffes begin their lives -- from the very first day -- taller than many human beings ever become. Typical newborn giraffe calf height is approximately 6 feet, according to the Giraffe Conservation Foundation. Just like in adulthood, however, male newborn giraffes are usually a little bigger than females. Within the first year of a young giraffe's life, you can expect the not-so-little one to grow almost another full 6 feet or so. To accommodate massive body weight, giraffes also weigh a lot, too. The average weight range for an adult giraffe is usually somewhere within the range of 1,100 and 2,800 pounds. Straight after birth, calves already tip the scales at around 220 pounds or so. Similarly to matters of height, female giraffes usually weight less than males. Part of the giraffe's great height comes from its slender and graceful legs. Just by themselves, giraffe legs are typically around 6 feet in length. Because of the long length of the legs, giraffes are often very speedy runners -- often capable of traveling at a very swift pace of 35 miles per hour, according to National Geographic.